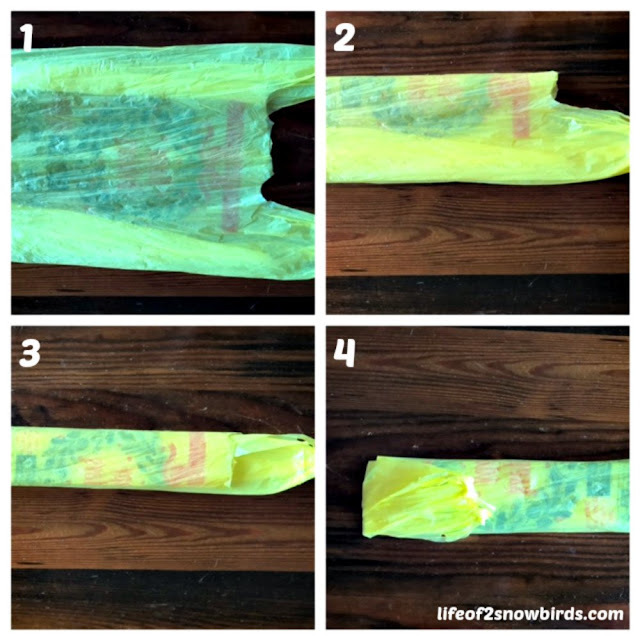 Do you have a ton of plastic bags shoved into a plastic bag? I did too and then I bought a fancy plastic bag holder. I was supposed to be able to put plastic bags in it, then pull one out of the bottom when I needed but it never worked. 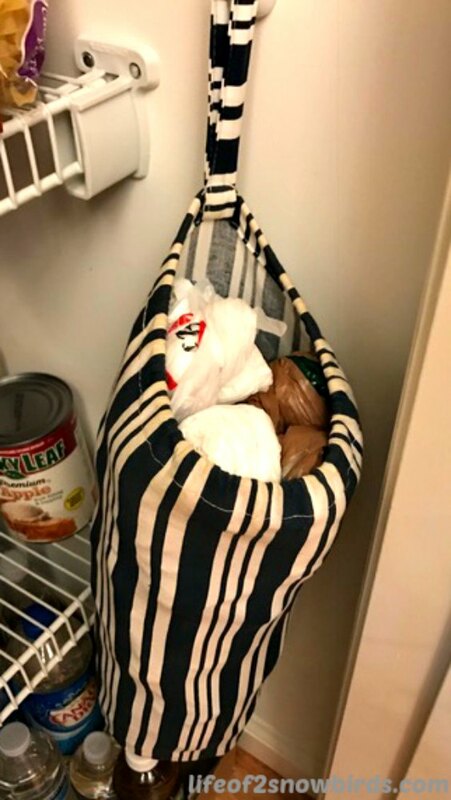 It was probably me doing something wrong, but anyway, I still store plastic bags in it but I found a way that works better for me. I fold my bags instead of just throwing them in. This is how I fold them. I call it a "Knotted Bag". 1. Grasp plastic bag at bottom with one hand while sliding other had up the plastic bag to get air out of the bag and to create a tightly squeezed bag. 2. 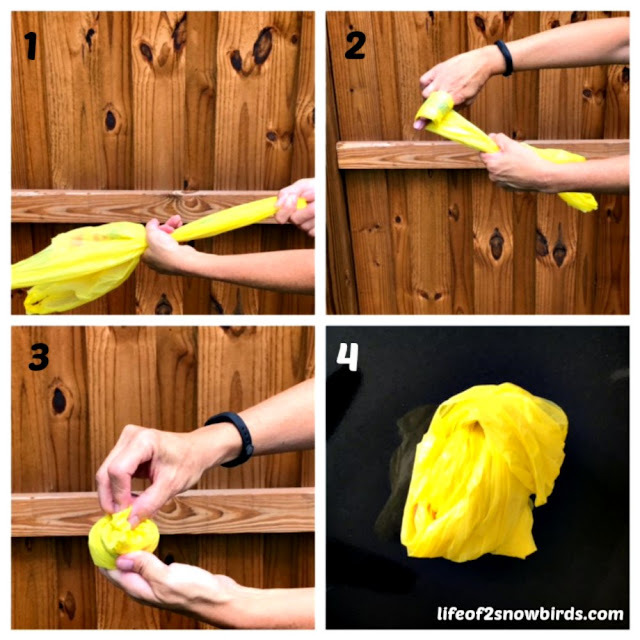 Twist the bag around two fingers until you only have about 2" of the handles untwisted. 3. Tuck the last 2" of the bag inside the opening made by your two fingers. 4. Give your knotted bag a gentle squeeze to secure the knot. 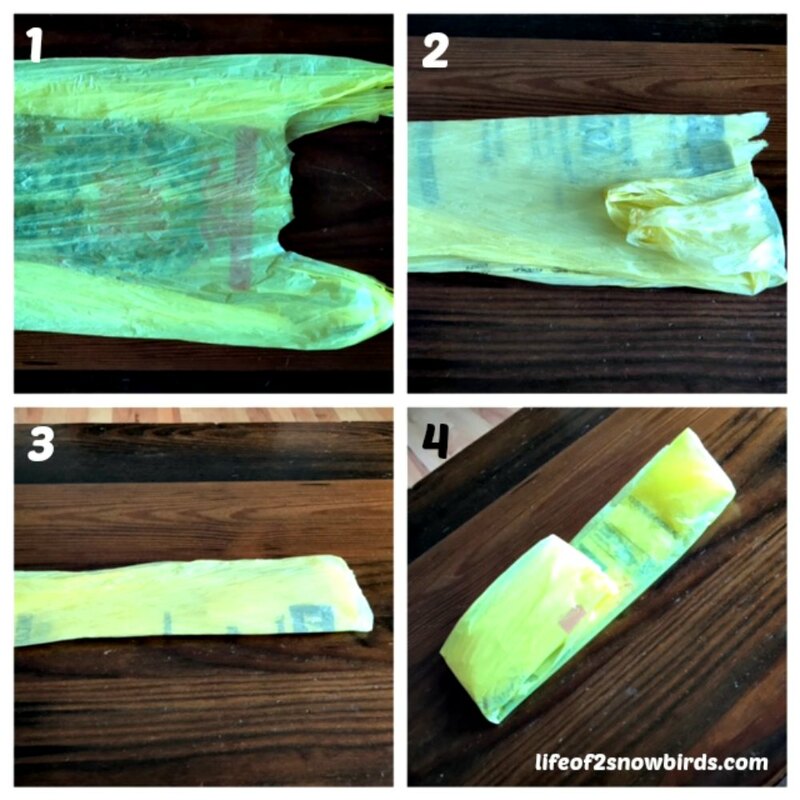 This is the easiest way of the three ways I fold plastic bags. It takes about 3 seconds. I can fit a lot more bags in this holder if I knot the bags and it gives a more neater appearance. This method works for storing but is not secure enough when I need to pack a few for traveling. They will definitely unravel if tossed around. So for a more secure bag, I use a folded "Triangle Bag". 1. Flatten plastic bag on a table. 4. Fold handle end down over bag. You will have a long rectangle. 5. Take the corner of the rectangle, by the handle you just folded, and bring it to the opposite edge of the rectangle so that it forms a triangle. 6. Take triangle and fold over and upwards towards the end of the rectangle. 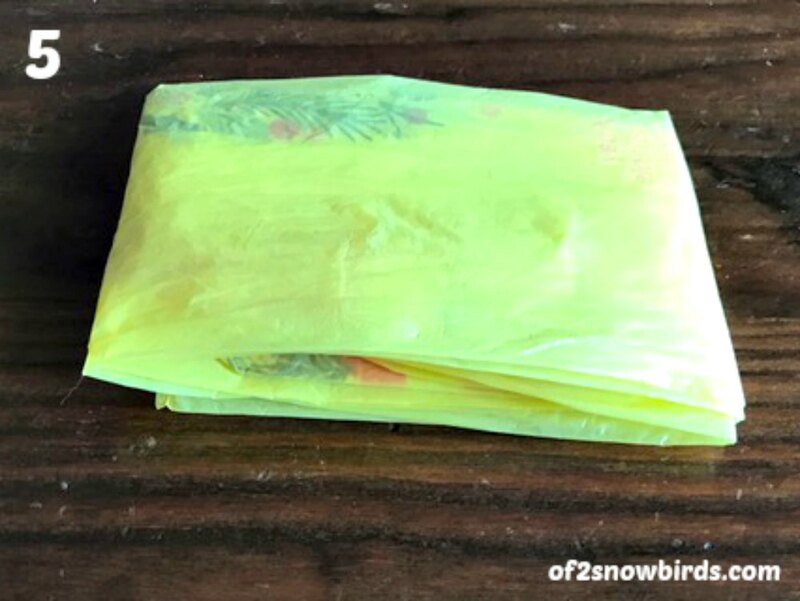 Keep folding until you are left with about 2" of the bag remaining at the top of your rectangle. 7. Tuck the 2" end of the bag into the triangle and press down on the triangle to secure. 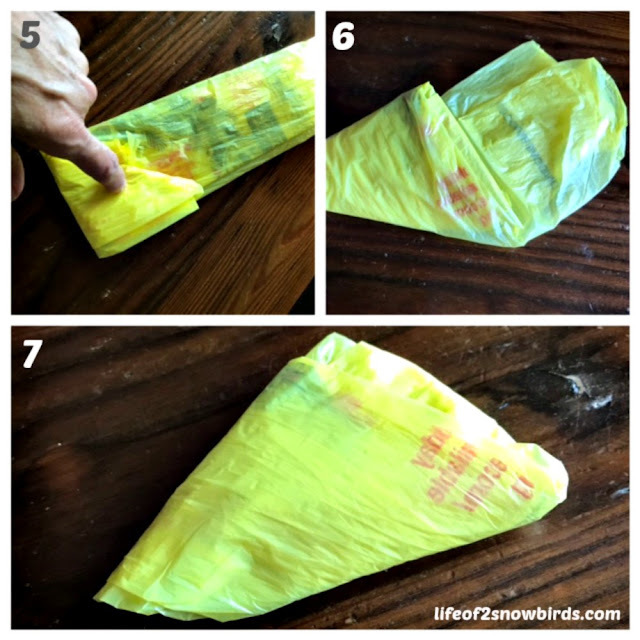 This is a perfect way to fold plastic bags when I want to throw them in my suitcase. I always have a couple of them with me when I am traveling for my dirty clothes, my shoes and my wet bathing suit. 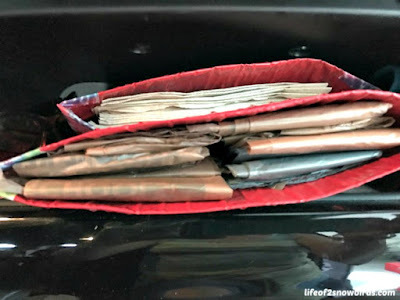 They have come in handy when I have filled the small hotel garbage pail and still have more garbage to get rid of and for extra things I have accumulated on my travels that I can't fit in my suitcase. The Triangle Bag is too bulky, though, for my glove compartment. I call the folded plastic bag that I need for road trips a "Flat Bag". 2. Fold bag in half lengthwise and fold handles down. 3. Fold bag in half lengthwise again. 4. Fold 1/3 of the bag up and then up a second time. 5. Press on bag to flatten. 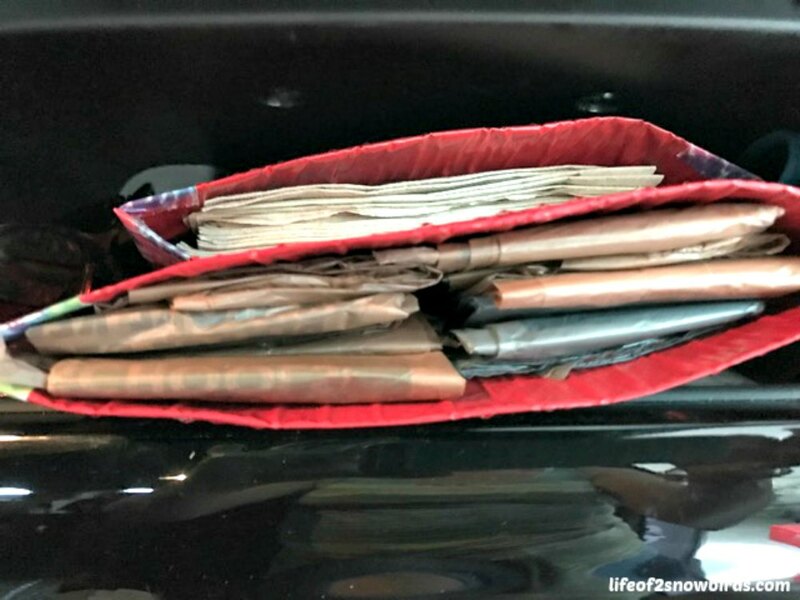 This is the way I fold plastic bags to fit into an "envelope" I made to organize our glove compartment (read about it here). 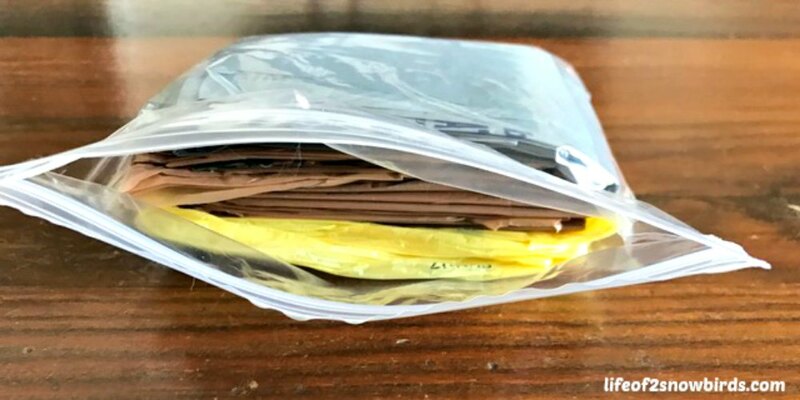 I make sure I have a supply of Flat Bags in our car when we go on a road trip for the mess we make after eating and drinking for hours in the car. 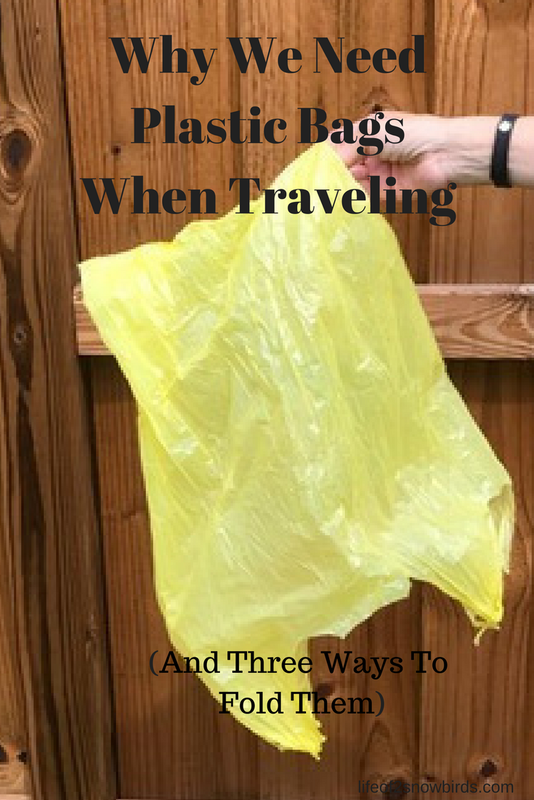 I also like to put Flat Bags in the bottoms of the small trash cans I have in my house so that when I take out a filled bag I have another to line my pail. These bags do need to be contained somehow because they will not stay folded otherwise. You can fit at least a dozen perfectly in a ziploc sandwich bag. Do you fold your plastic bags? How do you reuse yours? We'd love to hear your ideas! Those plastic bags are handy for many purposes... and they do fit so much better when folded (or tied). We seem to always be looking for plastic bags for some reason or another so I try to put them everywhere to always have them handy. I just toss my bags in another one until it's overstuffed. Your method is much better and is what I'll do from now on. Thank you for sharing with us this week at Celebrate Your Story and we hope you will join us again next week. I think a lot of people have the plastic bag stuffed with plastic bags. Glad you are using one of the folding methods to organize your bags now. 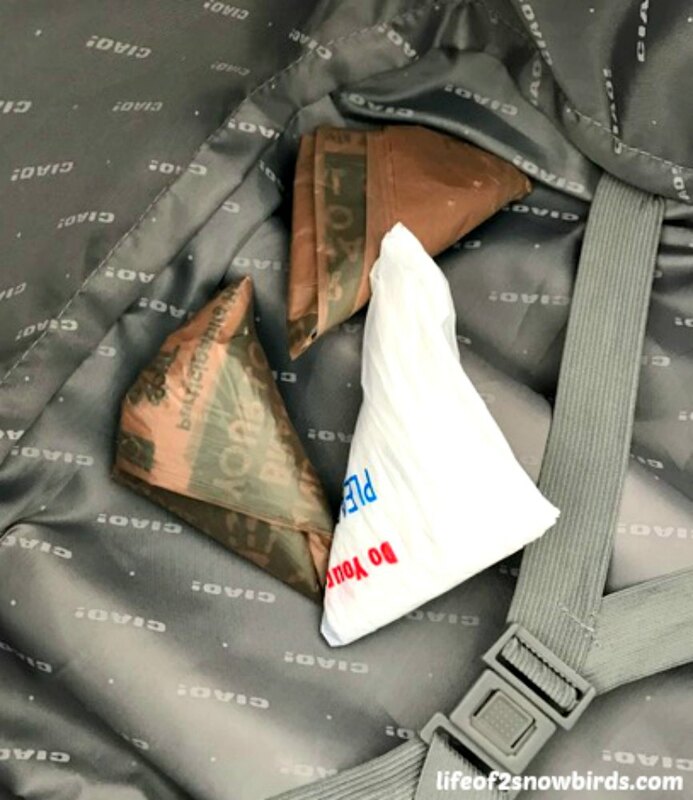 I do the triangle fold (paper football fold) and keep a bunch in a ziploc bag in one of the doors of my van. Very handy. Can't have too many in the car for sure! Great tips, they will come in very handy! Great tips!! My husband always does the first way you showed with rolling them up. I always toss mine in a bag. =) Thanks for joining us at #HomeMattersParty I hope you will join us again this week. That's funny. It's the complete opposite in our house! Great idea and tips!! This will come in handy in so many areas of day to day life! Thank you so much for sharing your fabulous idea with us over at Waste Not Wednesday! Thanks for having me at your party! That's a great way to store plastic bags. We have to bring our own bags to the grocery store now as they are encouraging us to get away from plastic - but I still like to keep some for messy things and to line my garbage cans. Thank you for sharing with us at Hearth and Soul. Hope you will visit again this week! We all really should bring our reusable bags to the grocery store but I do really need to have those plastic bags handy too! Thank you for visiting our blog! Please come again!! 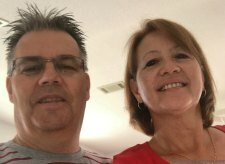 vela Enjoyed every bit of your blog.Really thank you! Keep writing.